Well, I hardly know where to begin. It’s been too long since my last post, but with the new year comes the committment to do better, so here goes. Me, Scott and the boys had a great Christmas. We went home to Florida and saw our precious families. We even were able to go to Disney World with our boys, my brother’s little boy, Cole, my mom and my 76 year old grandmother. It was the craziest day I can ever remember with 2 hour waits for almost every ride and trying to keep track of 4 little boys. I got there and panicked when I saw all the people. I thought, “What are we going to do if one of these boys gets lost! We’ll never find them!” So, I came up with a plan. I wrote my cell number 4 separate pieces of paper and told the boys to put that in their pockets with strict instructions that should they get lost they were to go immediately to the nearest official looking person and give them the piece of paper and ask them to call their mom. I thought I was so with it until I realized that none of my boys had pockets! But I was not to be thwarted so I had the boys put the piece of paper in their underwear. They didn’t seem to mind, but I had to have a giggle at the thought of one of them getting lost and pulling a piece of paper out of their underwear and handing it to someone. Anyway, a mom’s got to do what a mom’s got to do. Along with the trip to Disney, I got to sing at FBC Jax which was so much fun. It was great to see some old friends and to get to minister there once again was such a privilege. Sometimes I wonder what the Lord is doing in my life. I wonder if I’m really having an impact for the Kingdom at all. Then something will happen to remind me that even on the most common of days in the most ordinary circumstances, there is opportunity to speak for Him. I had just such an opportunity last week. The doorbell rings. I’m not expecting anyone and I’m clad in my uniform – a huge T-shirt, workout pants and a hoodie. I answer the door to, you guessed it, Jehovah’s witness. I talked to them for a few moments and everything was all smiles until I informed them that I believe and know it to be rock solid truth that Jesus is God. You talk about back pedaling, woah. They got so grave and treated like I was the most pitiful creature in the world. We talked for a while and I showed them several verses that proved that Jesus was not just a good man, but God. I told them that He was equal in every way to the Father and has existed as one with the Father from eternity past – they did not come around to my way of thinking. But I was so encouraged that I had the opportunity to speak up for the Savior and actually say what I knew would be hard for them to hear. As I closed the door, my heart was breaking at their darkness and how they can believe in a false god and how clever Satan is to concoct a religion that leads people down such a sinister path. I prayed that their eyes would be opened and the true Light of the World would shine into their hearts. One of the ladies came back the other day to drop off some literature that would help me see the light, I’m sure. So I’ll do my homework, take some notes and talk to her some more. I don’t know what will happen, but I know that the Lord loves her and that He is God whether she believes He is or not. I’ll keep you posted on how it goes. We all have a message, THE message. Let’s speak the truth in love and not be ashamed of the true gospel. It really is the power of God unto salvation. Nothing else will do. I am not a good sleeper. My mind goes so fast all the time that I have a hard time shutting it down when it’s time to crawl in bed and call it a day. So, an uninterrupted night of sleep for me is a rare commodity. A couple of weeks ago, my active mind was just losing the fight with my over-extended body and I was drifting off to that wonderful world of REM. It was about 1:30 in the morning and just as I was closing my eyes I hear, “Mommy, I need you.” My youngest son was leaning on the banister of the stairs with his tattered blanket slung over his shoulder asking for my help. What was I going to do? Ignore him? Get angry and think, “How dare he interrupt my sleep! Doesn’t he know that I need to rest?” No. Even though I was bone tired, the love of motherhood would not allow me to ignore him. He needed me and I was there. As I helped him get settled back in for the night I lay beside him for just a moment and kissed his perfect cheek. Even though he was asleep almost immediately and probably didn’t hear me, I whispered to him of my love for him and Jesus’ love for him. I told him that he could call me anytime day or night and I would come running. As I left him to his sleep and went back downstairs to finish the night, I thought about how what I had just experienced was a smaller scale of the Father’s reaction to me when I call upon Him. It doesn’t matter to Him when I call, He is always available. And what’s even more incredible is that, unlike earthly parents, He never slumbers or sleeps.(Ps. 121) He relentlessly watches over me and even longs to hear from me. Scripture is filled with requests from our wonderful Father to come to him and talk to him and even ask for what we need. Why don’t we do this? Is it because we think that He doesn’t have time, or that He doesn’t really care – that our requests are too small for such a big God? If we let that train of thought dominate our prayer life, we will never have the intimacy with Christ that He died to provide. Remember, He did die for you and it was not only to make a way for you to get to heaven, it was also to make a way for you to have fellowship with the Father. It must grieve His heart when we don’t take advantage of the privileges He died to give us. What’s the point? We are God’s children and He loves us. He wants to be “interrupted” by our requests even if it is the middle of the night. The veil of the temple was torn in two. He was trying to say something when He did that. (Heb. 4:12). So call on Him. Yesterday started out that way and then the Lord took my day on an unexpected path. I was just going through the motions of fixing breakfast for my 3 little guys and trying force myself to get moving when the phone rang. I looked at the number on the i.d. screen and didn’t recognize it. I knew it was a GA number and I have family and friends there, but I knew it wasn’t any of their’s. Then, like a thunderclap, it dawned on me. I was picking up a phone call from a very special new friend. She is one of the greatest Christian songwriters that the Lord ever dropped on the planet. 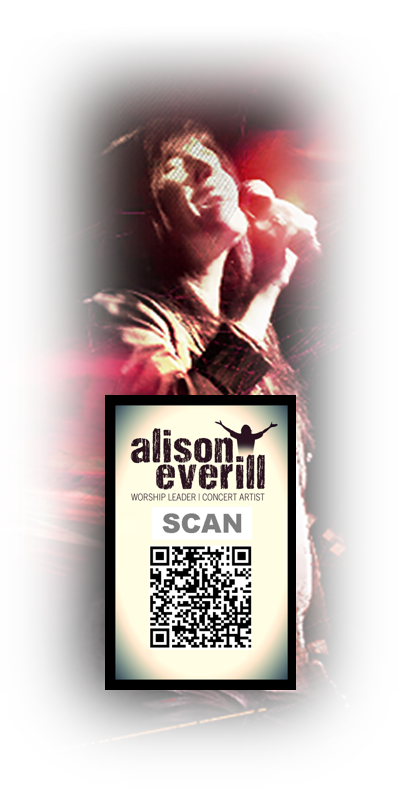 She has written songs that have encouraged the church for many years. She is also a very successful recording artist. So you can imagine my surprise when I heard a voice on the other line say, “Hello, may I speak to Alison?” and I squeak out, “This is she.” then she says, “Hello, Alison, this is So-in-so.” What is happening? Did the room suddenly tilt? I think I’m going to faint. I was so excited. To try to make a very long story shorter, she was calling in response to a song that I had written. She was excited about it and wants to work with me and help me get started as a Christian songwriter. So I talked to her very cooly, and calmly and then I got off the phone and did a happy dance right there in my bedroom. I was so overcome I didn’t know how to pray. Should I say, “Thank you, Lord!” No, that doesn’t quite cover it. Should I fall on my knees and commit to the Lord that any success He gives me will be used for His glory? That’s a little closer to the right response. But closer still, I ask my precious Father to forgive me for taking any day for granted. I beg Him to help me to trust in His plan for my life instead of allowing my mind to go to that place of chaos when I refuse to rest in Him. And, yes, I thank Him and commit that anything that happens in my life that gives me joy or pain will be used for His glory. Right now I am sitting in my living room. The sky is just begining to dim(I love this time of day) my 3 little boys are giggling in their bedroom and my husband is walking in the door safe and sound. I am smiling because this moment is a snapshot of God’s great grace in my life. I don’t deserve any of what I am experiencing right now, yet somehow, I am being lavished upon by the One who loves me most. As I think back over the last few weeks I really feel a sense of gratitude. It’s been so much fun. I’ve been able to cut a demo, go to a songwriters conference, and lead a night of praise and worship at my home church. These are all dreams fulfilled. I am so thankful that the Lord allows me to do what I love the most to honor Him. What could be better? Over the last 6 months things have changed drastically for my family. My husband, after pastoring for nearly 20 years, felt the Lord moving Him from ministry into the secular business world. Talk about a crazy time! We have been hanging on waiting for the Lord to open doors, windows, or even a doggie door! He has kept us in the dark, forcing us to trust Him. Imagine that! Trust God? Really? It has been a time for us to put our money where our mouth is, and God has been faithful. I watch Him daily bring my frantic heart back to the rock solid truth of Scripture and cause me to truly believe Him when He says, “Nothing can separate me from the love of God which is in Christ Jesus.”Rom8:39.